【JWF News Vol.156】　Projects of JWF Fund 2017 Decided! - Projects of JWF Fund 2017 Decided! - ４℃ AQUA PROGRAM 2017 started! During the Bon holiday, I passed through Kobe by bullet train. 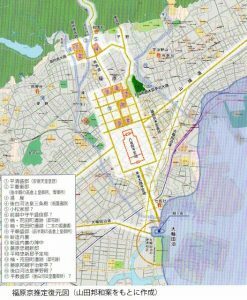 Looking at the topography of the city, I fully understood the aims of Taira no Kiyomori: why he had built his new capital, Fukuhara-kyo, in Kobe. I noticed that Kobe was a clean city. Since I have become particularly aware of matters to water and sanitation through my long carrier working with the JWF, I am always inclined to look at a place from the perspective of hygiene. The topography of Kobe is extremely different from those of Nara and Kyoto. Fukuhara-kyo was a capital built on a hillside in Kobe. Towards the end of Heian Period, around 820, Taira no Kiyomori, head of the Heike clan, supported Emperor Go-Shirakawa and became the first samurai (warrior) to be appointed Dajo Daijin (High Chancellor) under the auspices of the Emperor. Dajo Daijin was the highest government position, equivalent to today’s prime minister. He began to build the foundations of the coming samurai society. Taira no Kiyomori intended to relocate the capital from Kyoto to Kobe (Fukuhara-kyo). He built the new capital on a hillside overlooking the harbor, in present day Chuo and northern Hyogo Wards. This was Fukuhara-kyo. Taira no Kiyomori had higher aims for the relocation. The 250-year-old capital of Kyoto had become a dirty and squalid city. In the capital, 4.5km from east to west and 5.2km from south to north, there lived court nobles, Buddhist monks, samurai, farmers and numerous exiles. It is estimated that the population of Kyoto at that time was at least two hundred thousand, including exiles. In the forests around the city, almost all the trees had been cut down, and the mountains were in ruins. Kyoto had become a slum; human excrement was left to sit, and the plague spread throughout the city every year. Kamo no Chomei described Kyoto in his famous writing Hojo-ki. He wrote: “There were 42,000 deaths due to plague and famine, and the Kamo River was filled with piles of dead bodies.” People hated Kyoto and readily headed for Kumano, on the Kii Peninsula. Walking in the Kumano area was like a nature hike. Travelers could keep healthy, breathing in the fresh air of the countryside, away from squalid Kyoto. Taira no Kiyomori himself made a trip to Kumano several times. And he began to think of leaving Kyoto. The new capital would be Kobe. The topography of Kobe seemed very attractive to Kiyomori. There was the ocean in front, and a mountain range at the back. The only road was the Sanyo-do Road, running from east to west. 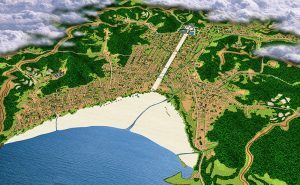 He thought that if he built the new capital on a strip of land on the hillside of Kobe, he would be able to protect the city from an influx of exiles by defending the east and west ends of the Sanyo-do. He also intended to take advantage of gravity and the blessings of the ocean. As Kobe was located on a hillside, human waste discarded into ditches would be carried away by the stream into the sea. The sea would turn human waste into a valuable resource. The constantly pulsing ocean waves would change the waste into nutrients for plankton. The plankton would attract numerous fish and shellfish. In 1180, the emperor at the time and his predecessor (the retired emperor) visited Fukuhara-kyo from Kyoto. Just when the capital had been relocated to Fukuhara, Minamoto no Yoritomo rose in revolt in Eastern Japan, so the emperor and his predecessor went back to Kyoto. During the wars between the Genji clan and the Heike, Taira no Kiyomori died of a fever. Fukuhara-kyo was burned down by the Genji clan. The Genji clan defeated the Heike and new era of samurai began. Minamoto no Yoritomo, head of the Genji clan, chose not to stay in the Kansai district but to live in Kamakura in the Kanto district. The topography of the Kamakura area resembled that of Kobe. The town of Kamakura was also built on a gentle slope extending towards Yuigahama Beach. Just like in Fukuhara-kyo, human waste was naturally washed away into the sea. It was tossed about by the heavy swells, stimulating the generation of plankton, thus attracting small fish and providing a richness of seafood. Although Taira no Kiyomori had designed a sustainable capital with an ecologically sound system of waste removal, his plan was never realized. In the end, it was Minamoto no Yoritomo, arch-rival of Taira no Kiyomori, who built such a capital. Japan Water Forum (JWF) Fund managed through fees from corporate and individual members and donations is the initiative that supports grass-roots organizations to address water-related issues in developing countries. Since its establishment in 2005, 156 projects have been carried out so far. In the JWF fund of this year, we have received 211 applications from 31 countries. ４℃ AQUA PROGRAM 2017 started! 4℃ AQUA PROGRAM is joint program conducted by by 4℃, which is jewelry brand aims to support women facing water and hygiene problems, and the Japan Water Forum. Since AQUA PROGRAM 2016, JWF has carried out the project in Bangladesh. By installing rainwater harvesting tanks and conducting training on operation and maintenance, 30 households will be able to access to safe drinking water and women and girls will be released fetching water.